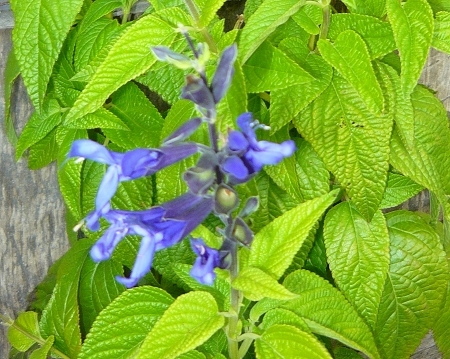 Black n' blue salvia (s. guaranitica) Also called hummingbird sage or anise sage. This salvia is one of the very best varieties to attract hummingbirds to the garden. Striking and unusual vibrant blue flowers with black calyxes on tall spikes. Blooms all summer and fall. Will quickly spread to 4' wide. Perennial zones 8-10. But worth growing as an annual in colder climates. Live starter plant in 3 inch container. Beautiful sage, blooms wonderfully, seems very happy with this hot and humid weather. A FANTASTIC plant for the mid-back of the border. Vivid blue blossoms that just keep on coming! Very attractive to hummingbirds. This plant enjoys moderate water and regular feeding. Prefers full to partial sun.